Let's learn more about the Canadian Provinces. The province of Ontario has more people living there than any other province. About 1/3 of all the people in Canada live in southeast Ontario. This province also has the nation's capital of Ottowa, and the nation's most populated city of Toronto. Ontario has a border along the US of about 1,678 miles. Almost all of that border is made up of rivers or lakes, and only less than one mile is actually connected by land. Ontario is in east-central Canada, right above Michigan. To the north are Hudson Bay and James Bay, and to the south it borders four of the five Great Lakes, Superior, Huron, Erie and Ontario. 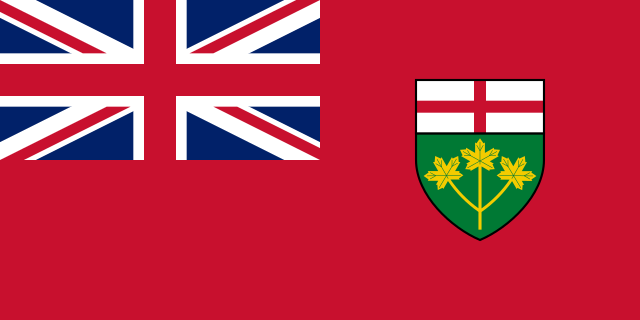 The flag of Ontario is red, with the flag of the United Kingdom and the state shield on it. Just like the USA, Canada was once a part of the United Kingdom. The coat of arms of Ontario has a black bear standing on an armored helmet which is above a red and white cross flag which is the flag of England. Below the flag is a green shield with three golden maple leafs on it. On the left is a Moose, and on the right is a deer. These are animals that live in Canada. Below the animals are the Latin words "Ut incepit Fidelis sic permanet" which means "Loyal she began, loyal she remains"
This means that the people of Ontario were loyal to England, even after the American Revolution. 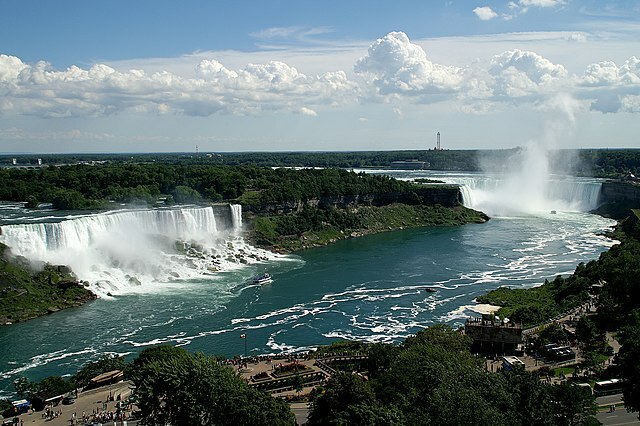 Niagara Falls is shared between the state of New York and the province of Ontario. The largest nuclear power plant in the world is in Ontario, at a place called Bruce Nuclear Generating Station. The largest city in all of Canada is Toronto. There are many things to see there, like the CN tower. Ottawa, the capital city of Canada is in Ontario. It is where the prime minister and parliament work for the government.